Norfolk Island Pine Turning Wood! 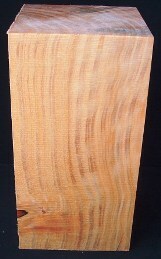 Norfolk Island pine turning wood has a characteristic pine color even though it is not a member of the pine family. Where the branches grow, it produces a deep, reddish-brown hue, which gives an appearance of an inlaid contrasting wood. 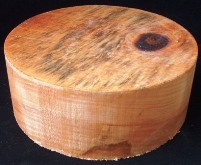 These Norfolk Island pine woodturning blanks contain atleast 4 knots/branches, most have 5 to 7. Some blanks may have tiny holes from the powder post beetle. 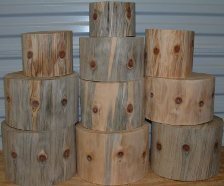 When turned, these woodturning blanks make a unique finished piece that are a very popular seller. 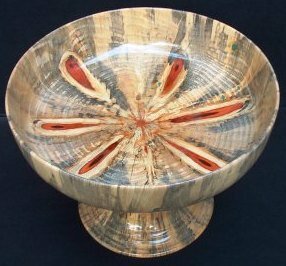 Commonly used in bowl turning; Norfolk Island pine bowls can take on a brilliant translucence that is difficult to achieve with other turning woods. The amount of spalting will vary with each blank. The branches grow at a slight angle; read our helpful tips on turning Norfolk Island Pine to determine which end to mount your blank. Mount on one end for a bowl, the opposite end for a closed form. 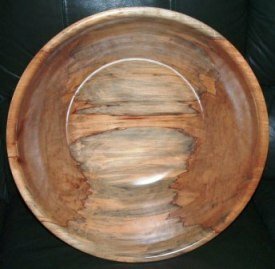 Steve made this beautiful bowl using one of the side-grain blanks. These do not have the characteristic branch pattern of the above end grain blanks.